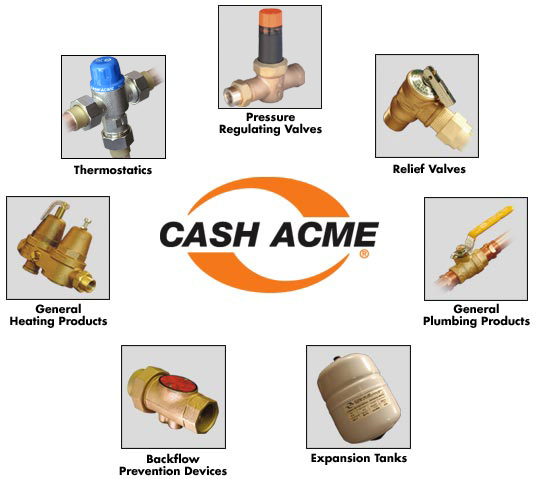 About CASH ACME: For almost 100 years, Cash Acme has designed and manufactured water pressure, thermostatic, and temperature valves. Since its origin in Decatur, Illinois to its current state-of-the-art facility in Cullman, Alabama, Cash Acme products have always been a respected name in the U.S. plumbing and heating industries. Pressure regulators, relief valves, backflow prevention devices, temperature valves, thermostatics, & general plumbing and heating controls and products. About Cash Valves: Cash Valve products are for steam, air/gas, liquid, and cryogenic applications. Products range in size from 1/8" - 2" for threaded NPT connections and up through 6" for flanged configurations. Cash Valve offers a wide selection of pressure reductions with initial inlets of 720 psi and reductions from 1 to 400 psi. Temperatures range between cryogenic up through 800°F. Materials of construction are offered with iron, brass, bronze, carbon, and stainless steel depending on your application and diaphragms of various elastomers and metal configurations. Temperature regulating valves, back pressure valves, cryogenic valves, pressure regulating valves, vacuum valves, and control valves.